Use coupon code "PW10" at checkout to receive your discount. Thank you. ​All of our pocket watches here have been hand selected for their technical prowess, rarity, condition and good working order. These pocket watches are special and represent the very best of American manufacturing, some going back over 100 years. All movements are in-house calibers. Finish, jewels and adjustments are all considered. All have their original porcelain dials that have no cracks or hairlines unless noted (but we only accept faint harilines). All are guaranteed to be housed in their original case and contain their original components. Pocket watches of this grade would cost thousands of dollars to manufacture today; and would retail for several thousands more. These watches make a whimsical, historic and affordable gift or addition to a fine collection. Furthermore, when selecting these fine watches, I choose ones that have evidence of actual service history instead of pocket watches that were never used as their intended purpose. I carry a variety of chains and Fobs on this page, you'll need them if you intend to use it. I hope you enjoy them as much as I have. Pocket Watches Make a Great Milestone Gifts or for the Man that has Everything. ​B.W. Raymond was used as a trade name used on pocket watch movements manufactured by Elgin. The "B.W. Raymond" watch was named after Benjamin Wright Raymond, the first president and one of the primary investors in the National Watch Company of Chicago (later renamed the Elgin National Watch Company). Mr. Raymond served as president from the organization of the company in 1864 until October 10, 1867. The name was used for nearly 100 years on many of Elgin's high-end movements, spanning the entire life of the company. This B.W. Raymond is one of the rarest and one of the highest end railroad watch of the time period. This classic 16s watch features a near perfect full Montgomery dial, with no hairlines or cracks noted; in fact, this dial is as good as you can find them. There are no chips and flakes around the edges...it's just very minty! The movement is super clean and well preserved. Very nicely done classic Geneva stripes as decoration sets this movement apart from many others of the era; and I believe 9 adjustments is the highest number of adjustments ever made. It's try there were many of these watches made, it was one of the most popular, like the Illinois Bunn Special. However, many are not marked 9 adjustments on the movement, these are rare and tough to find. This is another reason this watch is highly sought after. The case is in decent condition. There is a tiny shallow ding on the back cover as well as some slight brassing around the edge of the case back. There are no flaws noted on the sides or front of the case. The case has never been polished and is made by Elgin. It is 10k yellow gold filled and features very handsome engraving on the bezel and is one of the most classic and a personal favorite Elgin B.W. Raymond case. This is was serviced July 2018, runs, sets and keeps great time. Vintage 1909 Vacheron Constantin Private Label for Clark & True of Middletown Conn. This is a stunning and perfect example of a high-grade Vacheron Constantin private label solid 14k yellow gold pocket watch pre-1910. Just serviced and working within modern chronometer specs, The dial is perfect, the case is perfect, the movement is perfect - there is no problems or issues we can find with this watch. This is a very rare private label Clark & True of Middletown Connecticut. This is only 1 of 2 known pieces we could find made by Vacheron & Constantin. Here is another rarity in our collection, This watch was curated and purchased from a family estate. The Hamilton grade 992B is one of a few high-end railroad watch movements used in military operations. However, this piece is slightly different. This 992B is lever set, unlike most other military orders which usually are pendent set. Note that the 992B was made as a top grade railroad watch. All railroad watches (after the standards were implemented in 1893) must be lever set. So what this all means is that the only modification made was the factory authorized U.S. Govt. marking on the movement. This leads me to believe that the purpose of this watch was for government railroad use which was supervised by the Army Corps of Engineers. The final reason I believe that this watch was used by the Army Corps of Engineers is that the estate family member disclosed the recently departed did in fact work for the government in a Engineer position. Let's talk condition, the case presents itself as being in great condition. Not dings, dents or other common case issues . There is brassing (wear) on the bow and on the caseback. The movement has just been serviced April 2019, is super clean, amazing decoration, very high-end for a government watch with 21 jewels and all the 992B has to offer. Note the single sunk porcelain dial. Although I'm not aware of Hamilton dial rules; you mostly see double sunk dials on these. it's very common for military contracts to call for no sunk or one at the most. It's much more expensive to have sunken dials. Like the majority of our watches, the dial is superb with no cracks, hairlines, chips...it is near perfect condition. To wrap this up, this is a great interesting military watch used during WWII, with nice features like a great movement, case and dial. Very nicely decorated Longines (signed under the main plate) Super high-grade movement PAT Dec. 7th, 1886. This watch is in very good condition. As a gold filled watch, there is some light wear on the outside cases; however, no brassing is noted. The stunning bright white porcelain dial has no notable flaws. The design of the movement and the high-grade materials are of significance. This is a full hunter case. The hinges and clasps are in excellent condition. The piece is lever set and stem wind. Case is 54mm. The King Edward railroad watch, a private label manufactured by Rockford Watch Co. for Plymouth Watch Co. The is an extremely rare watch with a run quantity of 500 and a total production of 1500 - let's just say I could not find even one comparable on the market as of this listing. These are highly sought after watches, so before you lose attention let's go. The dial is near perfect with no hairlines or major chips noted (see photos). The movement grade 945 by Rockford is extremely well executed with amazing finishing and decoration. The watch was just serviced September 2018 and is running strong and keeping great time. I do not see any issues with the case and very little wear. There is nothing wrong with this watch that we can find - it's near perfect. This pocket watch is an important piece and these King Edwards appreciate in value every year and are very scarce. We recently sold another one of a different grade. If you're a collector and want to add a serious piece to your collection, or if your looking for an awesome gift - this is it. This watch is spectacular, it really doesn't get much better than this. Hamilton 992B Military - 21 Jewel adjusted to temperature and 6 positions. Rare early U.S. Military WWII era pocket watch #C74815 marked 992B U.S. Govt. on movement. This is a lever set and stem wind open faced watch and one of the finest watches ever made for use on the railroad. So revered were these watches that they were commissioned by the US Government who brought the 992B into service for the military in WWII. Base metal Keystone U. S. Military signed case houses a beautiful and sparkling damascened well running movement with a gold center wheel. ORDNANCE DEPT. USA and numbers engraved on case back. Dial is excellent with no major chips or hairlines (some slight faint hairlines) and has clean and clear black Arabic numbers with a Montgomery dial. Black spade pointers and sunk seconds dial. A scarce military watch that will look great in any collection for use or display. Recently overhauled and working at modern chronometer specs. This is a beautiful Non Magnetic Watch Co. railroad pocket watch manufactured by the "Peoria Watch Co." for the railroad industry. The watch is in perfect working order with a near mint double sunk glass enameled dial (no hairlines) and a glass "Bulls Eye" crystal (mint) in a beautiful polished nickel-silver "Illinois Watch Case Co." case. The watch has been serviced April 2019. The bow is tight and is the only place on the watch that shows wear by brassing (extremely common doesn't affect value). The front and back screws on nicely, easily and smoothly. This is an early watch with the raised gold setting jewels. The movement is a quick train with a "Brequet" hairspring. It is an "Adjusted" watch and of "Railroad" grade. Ser. No. 30682. It is Full Plate and has a nice Demaskeen nickel finish on the movement. These watches are very uncommon; evident by very limited information on research sites. Our guess is that very few were made. Also, for you railroad collectors out there, don't forget that this watch was made prior to railroad standards being put into place - so you see some things different than the standard railroad watch; like it being a sidewinder and a larger size 18s. But make no mistake, look carefully, this is a high grade movement for the period it was made. Don't miss this one, I have a feeling we won't see one again anytime soon. This is a larger size pocket watch measuring at 55mm in diameter; however, unlike the really huge ones that can be difficult to handle - this is a nice size and is built like a tank. Thank you. This is a very gently used rare men's Art Deco Elgin from the 30's. Very nice 17j adjusted movement with well done finishing. I really love the crown and bail, very cool design. The watch works perfectly. This was an estate piece and I do not think it was used much. The Enamel is near perfect along with everything else, the original finish, dial and box. about 44mm case, nice size for a suit or tux. This is pure swank, but classically done. This Hampden pocket watch is one of the rare ones manufactured in Springfield, MA instead of OH where you see most made. That is because the original Hampden Watch Co. was founded in Springfield and named after the county Springfield is located in, Hampden County. These are really tough to find especially in railroad grade and coin silver 18s size. I'm lucky because I live in a Springfield, MA suburb...and it's one of the only places I can still find these made in Springfield. The original porcelain dial is perfect and no flaws are noted. The watch is lever set and triple hinged. In fact, take a look at those hinges on the front bezel, this case maker wasn't messing around. The movement is clean as a whistle and just serviced March 2018; the watch is working as it should and is keeping excellent time. Thank you. I think this Howard might be my favorite piece in our collection right now. Yes, we have a lot of railroad watches, this is not a railroad watch; but a super high grade dress watch with a fantastic original dial, 14k solid white gold case, Howard's signature extra dust cover, and stunning engraving all around. The movement, the Howard Caliber 4918, was one of Howard's first in house calibers, and they made it very high end and in small numbers. The movement features 21 jewels, adjustments, superior finishing, and high end jewel settings. There are several interesting markings on the movement - is was a pat. pending in the US. There is some patina on this dial - other than that, there is no wear noted and no problems with this watch. It is stem set and size 12s, which is a men's dress pocket watch size. All the gold hallmarks are present, and the watch was just serviced April 2018 and keeps time to modern chronometer specifications. I believe this movement is capable of precision time more so than many others made in the 1800's. I would also consider this watch to be in the ultra-thin category. Although it would not win awards for it's thinness, it is a thin piece compared to most others of the era. There is the beauty, historic and artistic value of this watch, but what makes this what so special and rare, is the movement and case. This watch also comes with its original box as found in an estate sale. It's a perfect fit. The inside of the box is not in the greatest shape, as there are some tears in the fabric; however, the box is perfect on the side that the watch sits in place. The outside of the box is in excellent condition and is made of a resin type navy blue material. It is very hard and heavy but it is not wood like most Howard cases. Overall, this is a must have watch that makes my top ten list (high up there) in our pocket watch collection. This one should sell fast so don't wait if you love it. This South Bend railroad grade 227 is one of the highest grade watches South Bend made. In fact, when reading information about the history of the South Bend Watch Co. often if not all (or many) discuss the importance of the grade 227, referenced as one of the watches that South Bend manufactured among the highest grades, including the well known Studebaker grades and the Illusive Polaris. These, among a few other grades, completes the pinnacle of South Bend watchmaking for the railroad industry. Keeping in mind that South Bend made mostly, non-railroad grade watches, all of these that are, are fairly rare due to collectors holding onto them. This example of the 227 has a near perfect porcelain montgomery dial (just a couple tiny nicks no hairlines noted). The movement is decorated is a spectacular way. In fact. it is so decorated that it is difficult to read the marks on the movement. This 227 has the prefered 227 in a circle on the movement along with all its other accolades. I will point out that all the jewels on the 3 fingered bridge, are gold set and screwed in, along with a gold center wheel. The movement is adjusted 5 times like their other high end movements. The case is in excellent original shape. Marks inside the caseback shows service marks and pride of ownership. There is some wear on the watch and very little brassing noted on the bow and some small amount on the caseback. This watch is fascinating if you just consider the amount of hand decoration that was done...it must have taken days I would imagine. I've also have not seen this type of pattern used on a USA watch of this period. The watch was serviced September 2018. This piece would be a great investment piece, or an important addition to any serious collection - railroad watches also make great gifts. There are several things I like about this Bunn special railroad watch. One of them is the near perfect Montgomery porcelain dial. There are no major imperfections noted, no hairline or cracks noted. Although the Bunn is a probably the most plentiful of the higher end pocket watches. That said, fine details are defining the price of these pieces, more so than others. There are no major flaws or brassing noted on the yellow gold filled Wadsworth case; there are some very small indentations on the caseback consistent with pocket wear (when more than the watch was in the pocket, like coins perhaps which is the main culprit. This watch was serviced during our intake process, it came from a fine estate from a family with impeccable pedigree in the watch world. Unfortunately I cannot disclose whom or profit anyway from their good name. The priced has been marked down generously due to the small dent in the caseback; but honestly, they are of very little distraction, the camera adds 10lbs as they say. This is a great estate deal on a very rare Rockford Grade 555 with only 1,000 total production from around 1900. Very nice 10k yellow gold filled star case in excellent condition and no brassing noted. The back of the case has a classic design with no personal engravings. The dial is near mind with only a few small rim chips or flakes. I do not see any hairlines or cracks on the dial. The dial is porcelain double sunk which is the most preferred type of dial. The movement is extremely clean and the watch in general has been kept in safe keeping. We just serviced the watch May 2018 and it is running great and keeping excellent time. This is priced very low and will likely sell fast. As I've said in many listings, our prices are based on margin usually within value range, but when we get a really good deal, it gets passed along to you, and this is one of those great deals. This beautiful grade 454 professional railroad grade Father Time is of one of the highest grades in the family. The Father Time model was meant to be a less expensive watch compared to the ones marked B.W. Raymond. But the real truth is that, very little is different, other than less decoration from what I can see. It's a solid railroad watch with a near perfect porcelain dial with no hairlines or cracks noted. The case is in great condition with no brassing noted and a great factory design on the back with no personal engravings. It's the Pilot case, which is a really durable one. Take a look at the pride of ownership and the service record, one of the best I've seen. When we purchased the watch, I inspected it and it looked like is was just overhauled and it's keeping near perfect time. This is a very exciting new addition to our railroad approved pocket watch collection. Records show that this watch went to the finishing dept. at Hamilton on September 16, 1898; which means is was likely at the jewelers for sale early 1899. There are very few 17j pocket watches that are railroad approved, but what this watch lack in jewel count is overwhelmed with high end craftsmanship and materials. Let's start with the dial, this one is perfect, there are no hairlines found under 10x, no flaking or gouges. There is a tiny factory chip at 4 0'clock that you cannot see unless you remove the bezel, it's almost underneath the dial, and like I said, clearly happened at the factory or during a service and has no impact on value since it is so minor of a flaw. The dial is the most expensive and sought after porcelain, with a double sunk dial, very attractive uncommon Roman numerals, with a 60 sec outside chapter ring in arabic numerals. The signed dial is done in a beautiful cursive as Hamilton Watch Co. It appears that the watch has a factory original glass crystal in very clean condition. The case, measuring 55mm, is heavy and thick. Made by Keystone, one of the most regarded case makers, this is a 3oz. coin silver case. 3oz. cases are fairly unusual. The case shows wear, but not excessive, and two minor dents on the side of the case (one around 6 o'clock and the other at 2 o'clock off the side on the case back). These are both minor and are expected with the age case - and it's tough to find rare pocket watches still in their original case. Let's move on to the movement, the best part of this watch. Just serviced September 2018, Hamilton only made just over 2,000 of this Grade 938. If you look at Hamilton at a watchmaker in general, very few were made with this small number. For example, the 936, a popular railroad watch made around the same time, produced almost 24,000 pieces - and that's small too! As you turn the century, you see many Hamiltons with production numbers well over 50,000. Back to our movement. This was an expensive watch to make, which is probably why we see so little produced. Other than the features I've pointed out, we have a full plate movement with gold set screwed in jewels of both Ruby and Sapphire, gold gilt engraving, amazing hand done decoration on the entire plate(s), Breguet hairspring and full sapphire jewels on the palet. I took one picture with a flash, so you can get a better idea of the amount of decoration on this piece.This is an important piece for a serious collection, to start a collection or as a fantastic gift. This South Bend railroad ca. 1907 size 16s grade 227, is one of the highest grade watches South Bend made. In fact, when reading information about the history of the South Bend Watch Co. often if not all (or many) discuss the importance of the grade 227, referenced as one of the watches that South Bend manufactured among the highest grades, including the well known Studebaker grades and the Illusive Polaris. These, among a few other grades, completes the pinnacle of South Bend watchmaking for the railroad industry. Keeping in mind that South Bend made mostly, non-railroad grade watches, all of these that are, are fairly rare due to collectors holding onto them. This example of the 227 has a near perfect porcelain montgomery dial (just a couple tiny hairlines noted between 11 and 1 o'clock. The movement is decorated is a spectacular way. In fact. it is so decorated that it is difficult to read the marks on the movement; this 227 is a little easier to read due to its toning color of the movement and the fact that this. This 227 run is known to have much lighter decoration with a small run of only 2,000 & has the prefered 227 in a circle on the movement along with all its other accolades. I will point out that all the jewels on the 3 fingered bridge, are gold set and screwed in, along with a gold center wheel. The movement is adjusted 5 times like their other high end movements. The case is in excellent original shape. Marks inside the caseback shows service marks and pride of ownership. There is some wear on the watch and very little brassing noted on the bow and some small amount on the caseback. This watch is fascinating if you just consider the amount of hand decoration that was done...it must have taken days I would imagine. I've also have not seen this type of pattern used on a USA watch of this period. The watch was serviced January 2019. This piece would be a great investment piece, or an important addition to any serious collection - railroad watches also make great gifts. Stunning Rockford ca.1901, is the estimated production year; this is a railroad grade watch presented in impeccable condition, especially considering its age. The double sunk porcelain dial. which is quite nice, is near perfect and has no cracks or hairline noted. This is a rare 21 jewel adjusted pocket watch is a rare one, with under 1500 ever produced and I'm sure very few remaining. The movement also bears the coveted "RG" insignia on the main plate. This is not the case for all of them; in fact the archive picture itself shows the movement without the insignia. Anyhow, the whole point is that this is a feature that collectors love; because it's said that only the highest grade watches received this distinction; and it is also rare to see it. So far in my 15 year career I find this to be true. The case is .800 pure silver and is 3 oz as noted on the case. It's a nice robust watch; but I don't think many would guess it's an 18s, the case is a nice tight fit to the movement; which is uncommon and makes this pocket watch very easy to manage with the just one hand. For those who like a more modern simple look in a railroad (not USA) and chronometer grade watch. You'll see a lot of American looking movement characteristics; and the history of the company explains why. According to Dennison here is the unedited history. Before we go there I would like to comment on a few things. Obviously the movement is gorgeous and very rare to find on a Swiss or English watch. This is a men's size 16s, there are no problems noted and the watch has been serviced March 2019. There is a very nicely done engraving on the back cover. This watch is stem set and has a perfect double sunk white porcelain dial. manufacturer in the U.S.A at the time. In 1863, the talented watchmaker moved to Zurich in Switzerland, as he found the Swiss were more advanced in the production of watch parts. He joined Tremont Watch Company, heading the manufacturing side of the business and helped in the formation of International Watch Co. In 1871, A.L.D moved to England and after a short time in London he decided to setup home in Birmingham. A.L.D found a niche in the market for high-quality watch cases produced in large numbers and patented many designs for air and watertight cases. Originating from a small workshop on the side of the family home, the company called Dennison, Wigley & Company grew to produce 100,000 high-quality watch cases per annum. A.L.D died in 1895, but left behind a very worthy successor in his son, Franklin Dennison. This is an incredible find. Washington Watch Co. labels are tough to find, never mind with an early "Army Navy" movement. The Washington Watch Co. was a trade name of Illinois; as such, there were some very low production watches made with this label and the Arm Navy movement makes it quite rare. In fact, a very credible source states that only 50 total watches were manufactured with the label of Washington Watch Co.The Army Navy Grade movement; which was made very high grade with 21 jewels, adjusted, very well hand finished and extraordinary decoration. This is a lever set watch. In fact, if there were any supporting data at all, this would likely be railroad grade due to its age of about the late 1800's before all the standards were in place... the only reason it would not be later on is because of its size 18s which tend to be in large cases. The rail companies believed a 16s would be a more comfortable size, but that was all before this watch was made. It is said that these watches were made to commemorate the formation of the USA Army and Navy which were both formed by Congress in 1775; so this would likely be a centennial commemoration. Very few were made which tells me these were for high ranking officials; it is too high grade and would have cost too much to market to the general public. This is another large heavy piece about 60mm in diameter of solid coin silver (.800 pure); needless to say, it's a nice heavy piece to be proud of. The dial is white porcelain and is original to the case and movement; the hands and crown are also original. The dial has some minor issues, you can see in the pictures, and would be considered to be in excellent condition. Both sides of the case are screw down; the caseback is solid as shown with a plain polished back. The back of the case has a small dent in it, I would say no bigger than 1-2mm. There you go, what an excellent find and a great gift or addition to any important collection. Here is a wonderfully old Elgin American Pocket Watch, Railroad Approved from the 1800's while the powers at be were just setting standards for rail watches. This is why we see some very older rail pieces differ from the standards we typically rely on. Let me start off by saying, this is one big boy of a pocket watch; boasting about 60mm in diameters and a full 3 oz of coin (.800) silver. I can tell you that it weighs a ton ...not literally. But it is really cool to feel the weight and gravity of the piece. I have larger hands, so these are easier to handle for me. The dial is near perfect and is double sunk, which was a very tough task. It's beautiful white porcelain dial is still so white it's hard to believe it's well over 100 years old. The case is original to the movement as well as the hands, dial and crown. There are no major hairlines or cracks noted. The obverse of the case is snap off/on and the reverse is double hinged for the dusk cover and pleasing factory engraved pictorial reverse of the case. Being a stem set watch, you'll likely never have to take the top bezel off.This model has fairly low production for the era and is moderately rare. The watch was last serviced March 2019. Here we have an Elgin Royal Canadian Navy open-faced Military Pocket Watch, made in USA ca. 1943 (World War Two era). This is a 16-size watch, and measures approximately 51mm (2") diameter. This watch features a nickel silver screw-back-and-bezel case, a 17-jewel adjusted stem-wind and stem-set movement with a gilded finish, and a single sunk black porcelain dial with luminous hands and numerals (the luminous material no longer glows). The case is in excellent condition, showing signs of occasional pocket carry. The dial is in excellent condition except for a minor hairline near the 11 o'clock position (not noticeable by the naked eye). The movement runs and keeps excellent time, last serviced April 2019. Overall, this is a presentable and important military watch that is ready to carry or collect with pride. This is an excellent crossover collectible of interest to both watch collectors and Military buffs. You can own this very high grade, highly collectible American-made pocket watch now. Thank You. Here is a wonderful Art Deco style Illinois Pocket watch presented in 1932 at the Westmoreland Country Club which is in Wilmette Illinois and still is in business today. In fact, I'm sure they would love this piece for their historic collection. It is presented to Herbert E. Mueller as the Presidents Trophy . The Movement is an Illinois 527 Grade 19 jewels all of its information is at the bottom of the listing. This is a very high grade movement for a dress watch / presentation watch. This movement, as a slightly different configuration was also used as an approved railroad watch movement. We inspected this piece and it is very clean and great condition;and it has been through a service April 2019, ready to wear or add to an important collection. Take a look at the production numbers, very few were made of this grade, which means very few exist. Here are the highest quality pocket watch chains and fobs we can find without going solid gold as to make them affordable but still of prestige. When you buy our fobs or chains at the same time of a pocket watch purchase from adamvintage.com receive 10% off your chain or fob; use coupon code "combo" at checkout. Please do not use this coupon code without the purchase of a pocket watch at the same time or the order must be canceled. Thank you for your business and enjoy your shopping experience. What a great unique chain and fob from the 1800's. Nice big sturdy attachments, the chain measures approximately 10.5in which is perfect for many styles of wear a pocket watch. The matching fob is for decoration, but also served a purpose. This is a wax seal fob that can be engraved for a wax seal when sending a letter. This one has never been engraved. With amazing early German silversmith craftsmanship, this Krusius Brothers Germany Sterling Silver Pocket Knife has an awesome Griffin in high relieve. Some may say it's a mythical lion...whatever, it looks cool and it looks like a Griffin. The Pocket knife is just awesome and under inspection, and with my antiquities background, I would guess this was made in the late 1800's. It can be easily made into a pocket watch fob by adding a bail, it's just a little bigger than an average fob would be. Silver techniques these days can even make it look like it's always been on there, just find yourself a good silversmith...like don't bring is to Kay's. This is a very special three blade, one file tool knife. Love it! The knife appears to has a deco inspiration in its design and appears by examining certain manufacturer electments, I would guess the knife is vintage 1920s-1930s with a preference toward the 1920s. The is little wear on the knife, it has a great front two-tone design with lots of fine lines in the engravings. There are no personal engravings, which is great, as these make awesome grooms gifts if you're not a collector; what guy doesn't appreciate a nice knife made of gold? In addition to the area in the front meant for initials, the entire back is engravable - this is hard to find, and many people make use of it. Anyhow, the bail is marked "TOP GOLD" and the main sides have been tested 10k solid gold. The blades are quality and appear to be forged - they have not been cleaned or sharpened. The knife measures 2.5" with the bail, which is the perfect gentleman's size. 14.5" long antique multi-colored gold filled pocket watch chain marked SM Co. is in very good condition and simple deco design. Suitable for any gold or gold filled pocket watch. This is a real beauty. 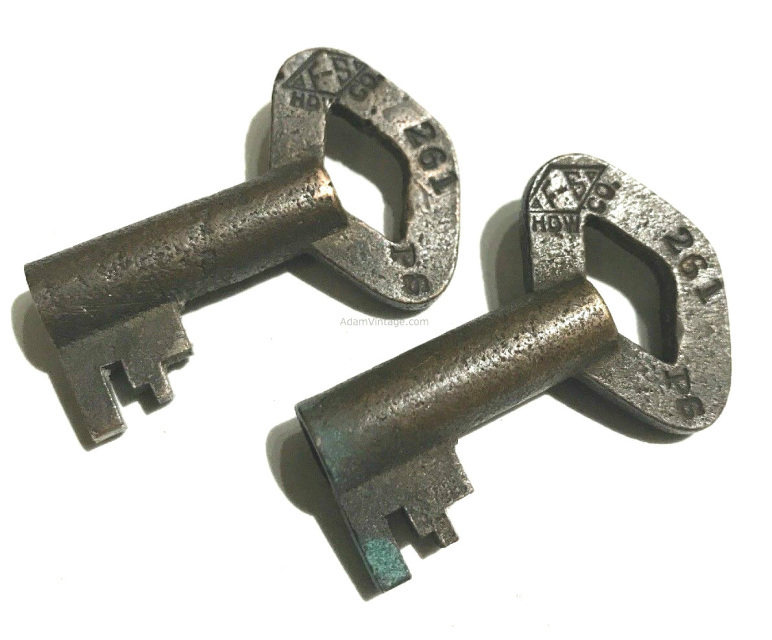 The key is silver, and measures 36mm tall, and 39mm long. It is ornate, and in excellent condition. It is used to wind a key wound pocket watch. This is a fantastic knife fob, a must if you wear pocket watches or have a collection. No personalizations or monograms. Hallmarked properly on the top of the bail. The maker is Voss of Germany, still to this day, an exclusive knife manufacturer. The blades are forged stainless steel. You can only find items like these in the most exclusive jewelry stores like Harry Winston, with prices well over a thousand. Measures approximately 2 3/4". This is not your run of the mill pocket watch chain. This is and was an expensive piece of jewelry meant for a very fine or special pocket watch. The fob is an ornate locket which opens for two tiny pictures or can be used for storage. The hinges are working like new and it snaps in the closed position very nicely. There is a semi-precious gemstone on both sides. They DO NOT test for glass. Our in-house jeweler believes these are red and green flat square cut garnets, no facets. Not marked, but the age and wear marks indicates gold filled. The hook is marked HF&CO. The chain measures 11" long from top of fob to the hook. The fob measures ~1" in diameter. This chain really has some weight to it - it is not meant for a small or ultra-thin pocket watch. This would go very well on a size 16s and larger thick dress pocket watch or a utility pocket watch like a railroad grade. There is a tiny scratch on the green stone. The chain and fob are in excellent display or usable condition. So, to sum it up, this knife Fob is super cool with awesome hand craftsmanship likely from the roaring 1920's era. There is some Art Deco coming through on the design I think. Toledo is still in business today, they had become Damascus Steel of Toledo and make very high end knives today, just like they did long ago just by seeing this example. The knife is steel forged, the space you see in particular the large knife, is not broken in any way, this is just how they cut the knife - these were hand made. The material used in the design that looks like gold does test for 10k gold; however, please note these are not solid gold sides, it appears the decoration was applied to steel. ​Disfrutar. Here is a fantastic art deco design, likely art deco period, this chain as excellent detail and finishing. It is two tone yellow gold and white gold filled. The luster of the piece is excellent, It is approximately 14" , weighs about 6 grams and has nearly no wear throughout with a fantastic design and design not normally seen on a bar and chain pocket watch chain. We really love this piece for those reasons. The watch does ot come with the chain, and is for display purposes only..
Vintage or antique pocket watch chains, especially with a nice knife Fob can get expensive. We picked this up at a bargain, so we are passing it along at the best price we can. The knife and chain are in exceptional condition. The blades are marked stainless steel. There are no hallmarks to indicate the value of the gold fill - the brand is marked on the bail "Simmons". I am guessing it is 10k yellow gold filled. There is no brassing or wear noted and no personal engravings. It appears that the chain and Fob were not used often or perhaps never. You get the chain and the Fob in this deal! Starting in the 70's it appears pocket watch chains finally moved to a better claspe. This piece is a very clean estate piece that appears never used or hardly used. Since we are dealing with steel, there is little to no wear on this chain or fob. 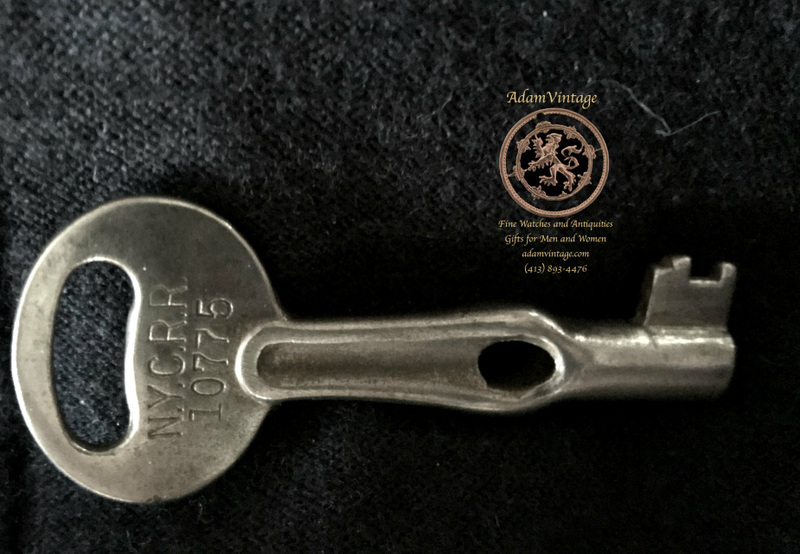 This v​intage colonial brand knife fob featuring subtle alternating waves and pillars design with no personal engravings. Overall a beautiful example of a vintage pocket watch chain and fob. This is a very unusual and masculine mini pocket watch fob, all indications show it was made in the USA either in the late 1800s or early 1900s. The watch is aged, but it aged well. The marble sides are all perfectly intact, the ends and rest of the case appears to be silver and the knives forged steel. The knives are probably in the worst condition; mostly because of pitting in the blades; however, it goes with the age of the watch and I think the blades in the condition they are in adds a lot of character. The knife has a nice bail, is on the smaller side, a little over 2". Quite rare to find using these materials. If you're guy, or girl loves the whimsical nostalgia that railroad buffs are attracted to, you've reached your destination. Collectors are certainly welcome too. In this section you will find items related to early USA railroad history. Many of these items are tough to find, and you may not see again. If you like it, grab it before it's too late. Please note, we take down listings of sold items in this section weekly. As always, if you can add an item in the shopping card, that means it is in stock. Once it is in your shopping cart, the item will show out of stock, only on your screen. To all other viewers, the item(s) in your cart will still be available until someone checks out successfully using paypal or secure checkout. Happy Shopping!